From the comforts of home in Tokoroa, New Zealand, where walking around the town barefoot was the norm, to the bright lights and fast moving pace of the City of Bradford in the North of England, where Robbie Hunter-Paul and his family were subject to a few gazes of disbelief as they walked around the city centre without wearing so much as sandals on their first day there. It was safe to say Hunter-Paul had made a big change to his life, and at such a young age. But his move to Bradford Bulls would ignite the start of hugely successful career at the top of the Rugby League game in England, which spanned over the course of 17 years. The 40-year-old was only 18 when the move to the Bulls came about, and to understand the cultural differences that was about to become a reality for him, he tuned in to Sky Movies to watch the Bradford based film Rita, Sue and Bob too. “We were one of the first families in our neighbourhood to get Sky as we followed the Rugby League in Australia. “I knew nothing about the culture in England, and I knew less about a city in the North of England called Bradford. Rita, Sue and Bob too is a British cult classic about a guy who sleeps with babysitters on a council estate in Bradford, and that was my introduction. The former Scrum-half believes British people are among the most tribal in the world, although he claims they don’t even realise to what effect. Hunter-Paul pinpoints his success as Captain of the Bulls at such a young age as being down to managing all of his teammates personalities, no matter where they had come from, no matter what ‘tribe’ they were a part of. “Depending on what side of the street you grew up on in Britain, you will go ‘Nah I’m not speaking to that lot over there’. The melting pole which is a professional rugby team, you have so many different backgrounds and cultures. 1996 turned out to be a phenomenal year for the Kiwi, when he ended the season as the the Bulls top try scorer, before winning the man of the match award and the Lance Todd Trophy, after scoring three tries in the Challenge Cup final against St Helens. “When I scored the first try I rolled over and there was a wall of 30,000 Bradford fans, it was just amazing. We were losing at this point so it got us back into the game and within 2 points. It was rock star moment. Although throughout his career Hunter-Paul worked hard to never make costly mistakes, he’s reminded daily of one in a Grand Final between Leeds and Bradford where he fumbled the ball around the Bulls own 22 with only minutes to go, a mistake that eventually led to the Rhinos overturning the Bulls lead and winning the final. “My father taught me one of the best lessons in life. He told me that if I made a mistake it’s not your fault, but if you make it again it damn well is. Because you should have learned from the first time you made that mistake. You don’t need to be a world class sportsperson to understand sibling rivalry. You fight, squabble and kiss and make up countless times before you grow up into men, and even then not a lot changes. Robbie played alongside his brother Henry at the Bulls, but they had to face up against each other as rivals too. “He’s the best player I’ve ever played with or against. The way he was able to transcend his game to international level was exceptional. He’s a very driven man, and I picked up some of my skills from him. With his career in England blooming, a personal dream of the New Zealanders that stemmed back to being a six-year-old was about to become a reality in 1997, as he was set to represent his country for the first time. Not even his initial self questioning of his worth of wearing such a shirt would hamper one of the proudest days of his life. “It was such an honour to lead the Haka against England, the other half of my life. That was a truly joyous day, and one of my proudest moments as a rugby player. “I remember stood in front of my shirt whilst it was on the hook, and suddenly things go through your head like ‘am I even worthy of this jersey?’. Although he came to England with little knowledge of the culture, he remains resided here, married to an English wife, with English children, and will be seen as legend that will forever have his story written in the Bradford Bulls history books. 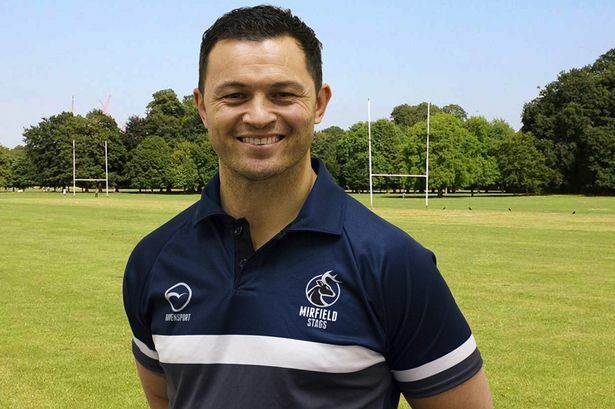 He may have moved to the country originally for his Rugby career, but he is quite happy to admit he stayed for the people – And thankfully he now has enough shoes to not worry about those looks of disbelief that shoe-less day it all begun. Posted on March 12, 2016 March 11, 2016 by Ross William GibsonPosted in Rugby, Rugby League, Rugby UnionTagged Bradford, Bradford Bulls, Captain, England, Haka, Harlequins, Jersey, Leeds Rhinos, New Zealand, Robbie Hunter-Paul, Robbie Paul, rugby, Rugby League.